Other ingredients are Ascorbic acid (E300), cellulose microcrystalline (E 460a), hypromellose (E464), hydroxypropylcellutcse (E463), methacrylic acid – ethyl acrylate copclymer, o-acetyftriethylcitrate, talc, sodium laurilsulfate, polysorbate 80 and purified water. The capsule cap contains: gelatin, titanium dioxide (E171), red iron oxide (E172) and black iron oxide (E172). The capsule body contains: gelatin, titanium dioxide (E171), red iron oxide (E172) and yellow iron oxide (E172). Ferro Sanol duodenal is an iron substitute in case of latent or manifest iron deficiency with and without development of anaemia for instance: Iron deficiency anaemia, in particular during pregnancy and lactation, in childhood, in persons taking low iron diets in acute or chronic blood loss. 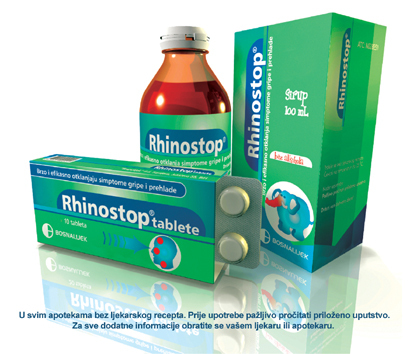 children below age 6 should not take Ferra sanol duodenal . given together with erythropcietin. particularly elderly people presenting with blood or iron loss of unknown origin have to be particularly carefully exarnined for the cause of anaemia I source of haemorrhage. iron preparation may cause pcisoning ~pecially among children. the absorption of Ferro sanol duodenal could be inhibited by iron complexing agents (such as phosphates, phytat8S-a!lcLm!lates) contained in vegetable food and conotitl.le.’1!s..of milk, coffee and tea. The interval between the administrations of these compcunds should be at least 2h. Ferro Sanol duodenal has no known risks during pregnancy and lactation. Please inform your doctor or pharmacist if you are taking or have recently taken any other medicines, even hose not prescribed. iron salts: Administration of iron intravenously concomitantly is not recommended. with oral administration of iron it may induce hypctension or even oollapse due to the fast release of iron due to saturation of transferrin. Doxycycline: Orally administered iron salts inhibit the absorption and the enterohepatic circulation of doxycycline. The combination should be avoided. the following combinations may require do”Se adoption: iron inhibits the absorplioQ of many medicinal products by chelation. 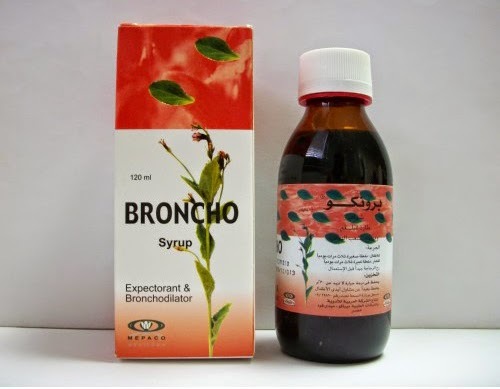 The interval between the administration of Ferro sanol duodenal and Ihe medicinal products menlioned below should therefore be as long as possible. least 4 h after Ferro Sanol duodenal . Methyldopa (L-form): When ferrous glycine sulfate was given at the same time, or 1 h or 2h before the melhyldopa, the bioavailability of methyldopa was reduced 83%, 55% and 42% respectively. The interval between the administrations of these compounds should be as long as possible. Thyroid hormones: When coadministered the absorption of thyroxine is inhibited by iron, which can affect be result of the Ireatment.The interval between the administrations of the compcunds should be at least 2h. Tetracyclines: When coadministered orally iron s~ts inhibit the absorption of tetracyclines. The interval between the administration of Ferro Sanol duodenal and letracyclines olher Ihan doxycycline (see above) should be at least 3h. Bisphosphonates: Medicinal products containing iron form complexes with bisphosphonates in vitro. When iron salts are co-administered with bisphosphonates, the absorption of bisphosphonate may be impaired. The time-interval between the administration of these medicinal products should be at least 2 h.
Levodopa: The simultaneous administration of iron sulphate and levodopa to healthy volunteers reduces the bioavailability of levodopa with 50%. The bioavailability of carbidopa is also reduced (75%). The interval between tne administrations of these compounds should be as long as possible. Nonsteroidal anti-inffammatory agents: Concomitant administration of iron salts with non-steroidal anti-inflammatory agents may intensify the irritant effect on the gastrointestinal mucosa. Antacids: Antacids containing oxides, hydroxides or salts of magnesium, aluminium and calcium chelate iron salts. The interval between the administrations of these two compound groups should therefore be as long as possible, the minimum time is 2 h between the administrations of the antacid and iron. Calcium: The concomitant use of iron and calcium decreases the absorption of iron. Ferro sanot duodena should be taken apart from calcium-containing food and beverages. The benzidine text can be positive during an iron therapy. Others: When iron is administered orally, a dark coloration of the faeces, not resulting from occult gastrointestinal haemorrhage, may occur. The guaiac test may be false positive. exceptional cases not be exceeded. If you have the impression that the effect of Ferro sanol duodenal is too strong or too week, talk to your doctor or pharmacist. Without chewing, adults and children from age 6 take 1 capsule once daily with sufficient water. The capsules are to be taken at sufficient intervals from meals (for instance, on an empty stomach in the morning or between two principal meals), because absorption can be reduced by ingredients of food. The duration of therapy is determined according to the laboratory follow-up study results. of the deficiency, but generally about 10 to 20 weeks treatment is required, or longer in case of persisting underlying pathology_ Treatment duration in prevention of iron deficiency veries depending on the situation (pregnancy, blood donation, chronic haemodialysis, planned autologous transfusion). If you may have taken more Ferro sanol duodena.- than you should, talk to a doctor or pharmacist immediately. In general the administration of milk and egg whtte inhibits iron absorption. If you forgot to take Ferro sanol duodenal”‘, do not !like a double dose to make up the forgotten individual doses. When treatment with Ferro sanol duodenal is stopped, the therapeutic success is jeopardized. 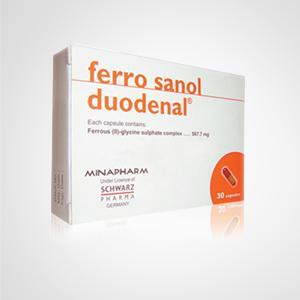 Like all medicines, Ferro sanol duodenal can have side effects, although very infrequent. The doctor should be informed as soon as any of the following is noticed. Gastrointestinal complaints such as diarrhoea, constipation, heartburn or vomiting were observed. Hypersensitivity reactions of the skin, e.g. exanthema, rash and urticaria may appear in very rare cases. A dark coloration of the faeces as may occur during the treatment results from the iron contained in the drug although it is harmless. Ferro sanal duodenal is an oral iron substitution preparation provided as hard capsules, which contain enteric coated granules. The caps!J,’es are sealed in blisters and packed in boxes containing 30 capsules. Do not store Ferro sanol dugdenal at temperatures above 25′ C.
Keep Ferro sanol duodenal out of the reach and sight of children.